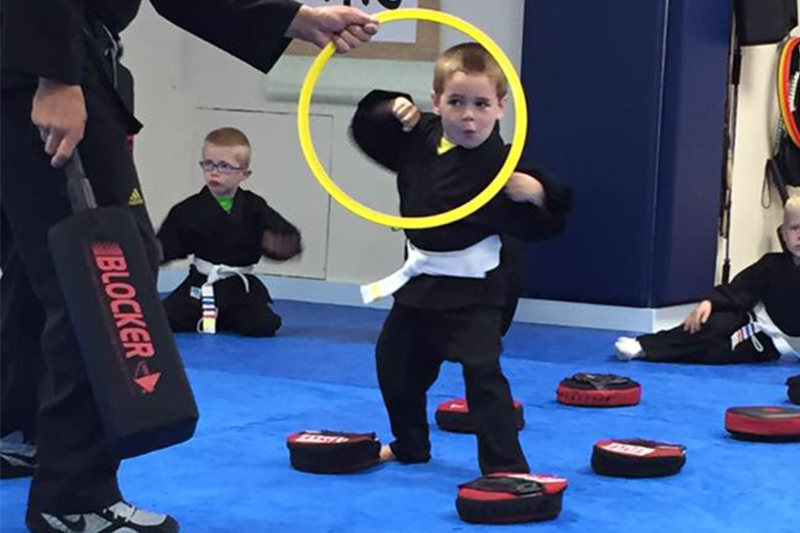 This class is an easy and fun way for pre-schoolers to get involved in a structured group activity and get an introduction to the martial arts. This small, active group emphasizes learning to follow directions and developing motor skills in a supportive and playful environment. The small class size gives young children the kind of individual attention and care that they need as they learn to interact in a group. Creative use of exercise and play equipment builds balance and co-ordination. In this class, students get their first exposure to the principles of the martial arts philosophy such as doing their best effort and learning respectful interactions with peers and instructors. Check out our schedules for dates and times. Click HERE for more information or a FREE trial of our Little Dragons class. A blend of focus and fun, this 40-minute class is perfect for ages 5 and 6. We introduce the art of Kempo Karate with a focus on life skills and personal development. Classes are small; most offer a ratio of about 6 to 8 students to each instructor. Students enjoy a lively and fun routine that is great for a child’s motor development. They participate in the basic blocking and striking drills which provide a perfect outlet for an energetic child while building self-confidence and self-control. Shy children develop confidence and physical skills, energetic children acquire self control and an appropriate outlet for their energy, and all children have a great time with this program! Through the belt ranking system children learn to set goals and work toward them, as well as the value of patience and perseverance. Our instructors and Junior Leadership Team strive to be positive role models for the children. Check out our schedules for dates and times. Click HERE for more information or a FREE trial of our Tiny Tigers class. A blend of discipline and fun, this 45-minute class is perfect for ages 7-9. This class combines the action and excitement of the martial arts with a complete self-defense system taught in a responsible and age-appropriate manner. Emphasis is on safety first and proper form, in everything from learning how to fall safely to how to strike without impact (for sparring), to how to hold a striking pad safely. Students at this level are taught the basic guidelines for ethical use of force, at an age-appropriate level, as well as non-violent conflict resolution through role-playing exercises and discussion. The overall emphasis is on high performance in a supportive and fun environment. The benefits of this program are as varied as the individual children who enroll in it. Shy children acquire confidence, energetic children acquire patience, easily distracted children acquire focus, non-athletic children acquire strength and agility, and strong, active children acquire respect and self-control. All children can benefit from enthusiastic participation in a healthy activity, and develop the self-esteem and strength of character to help them resist unhealthy peer pressure. Check out our schedules for dates and times. Click HERE for more information or a FREE trial of our Jr. Kempo class. 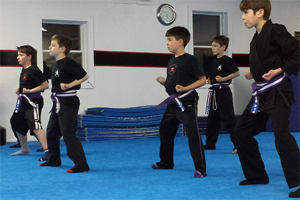 This group bridges the Junior and Adult Kempo Programs. 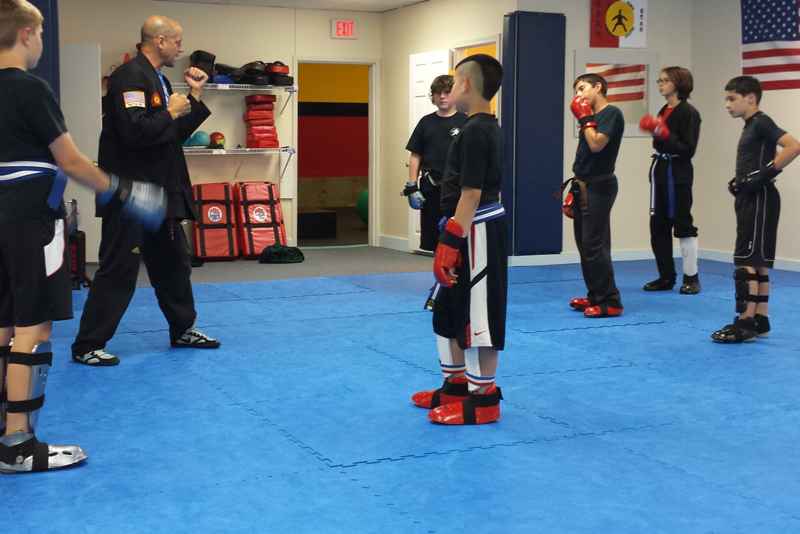 While still employing the philosophy and practice of making learning fun, the Teen Kempo Karate class offers more serious training, more challenging workouts, and more sophisticated self-defense concepts and techniques than in the programs for younger children. Teen Kempo Karate students also have the opportunity to become a member of our Junior Leadership Team, and assist our instructors with teaching and mentoring younger students. Check out our schedules for dates and times. 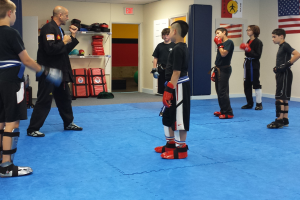 Click HERE for more information or a FREE trial of our Teen Kempo class. Brazilian Jiu-Jitsu is a form of wrestling that is perfect for active, “hands-on” kids who need a safe, sportsman-like, and vigorous outlet for their energy. This class is structured with a fast-moving pace that allows kids to learn the required skills while practicing in a high-energy format. Because it does not include punching, kicking, or striking techniques, Junior Brazilian Jiu-Jitsu allows students to safely spar with a more realistic level of resistance than they could with impact martial arts such as Karate or Taekwon-Do. This makes for a faster learning curve for self-defense skills, development of physical confidence, and overall proficiency. 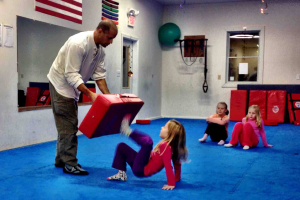 Further, it provides kids with a practical means of self-defense that can be applied with minimal chance for injury. And, there are opportunities for local competition for all age and skill levels, at the Vermont Open Grappling Championships. Check out our schedules for dates and times. Click HERE for more information or a FREE trial of our Jr. Brazilian Jiu-Jitsu class. Created by Sensei Quinlan for use in elementary, middle and high schools, Bushintai-Do draws from the purely defensive aspects of the traditional martial arts, and is a complete martial arts system in itself. 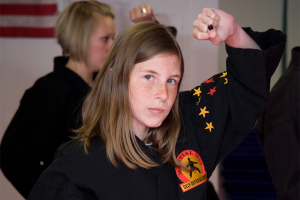 It offers self-defense techniques, pre-arranged routines (kata), a comprehensive fitness program, a positive philosophical foundation, and the integration of mind and body development. It brings the action and excitement of the martial arts to children and adolescents, but is safe for all students to learn and practice. Sensei Quinlan offers Bushintai-Do as a classroom-based or dojo-based program and has taught this program for schools in Winooski, Colchester and Georgia, Vermont. Learn more about this program by visiting bushintai-do.martialwayvt.com. Click HERE for more information about Bushintai-Do. ThinkSafe teaches children about self-defense and safety that is easy to understand and not frightening. Children are taught the common lures pedophiles are known to use in a practical but non-frightening way by role-playing and practicing effective verbal, tactical, and physical skills. Children also learn how to verbally defuse a confrontation, how to resist aggression safely and non-violently whenever possible, and how and when to use physical force, if necessary. This program is often offered through the Parks and Recreation Departments of Milton and Colchester, but is held at Martial Way and taught by our instructors. Since the schedule varies, please contact us about up coming classes or about scheduling a custom training for you or your organization. Click HERE to request more information about our ThinkSafe for Children class. 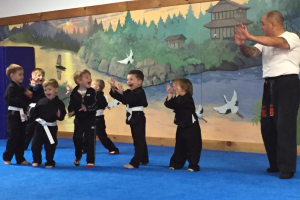 Martial Arts Camp provides a fun week of engaging physical activity. Children respond to the action and excitement of the martial arts, while parents appreciate the discipline, focus, and important life skills it teaches. Camp is a great way for beginners to get an introduction to the martial arts, and many come away with an exciting new hobby. Kids have fun, are active all day, and learn a lot. Camp sessions are typically one week long, although some individual days are available. Choose from full and half-day programs. Learn more about our camp dates and fees HERE. 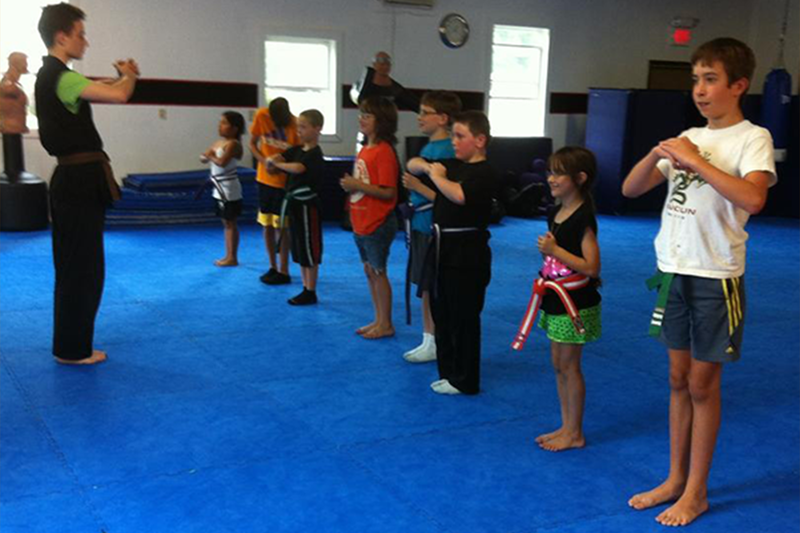 Click HERE to request more information about our Martial Arts Camps for children.